0.8x12mm Crypto Cut / DIN Security Level P-6 for information requiring extraordinary security. More Info. The Fortishred 3250SMC is an 0.8x12mm Crypto Cut shredder and provides powerful, high security shredding for 10+ users in a shared working environment where employees handle high confidential information on a regular basis, i.e. in government department or military installations. This model features a continuous duty motor, meaning that it can be used at any time, regardless of how many people have used it beforehand, so sensitive information can be destroyed as quickly as possible. It can shred up to 9 sheets of A4 paper and features a large 100 litre pull out waste bin. 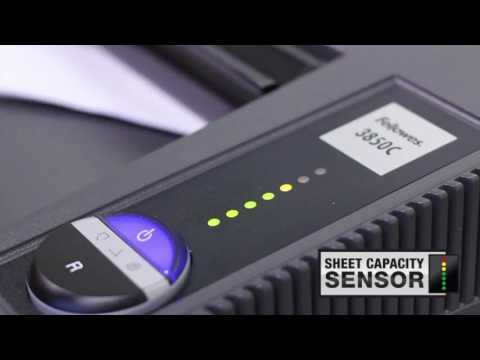 The model also features a Sheet Capacity Sensor that will help prevent paper jams by indicating the sheet capacity levels during the shredder process, as well as an electronically controlled Safety Shield at the paper entry throat to keep fingers a safe distance from the cutters, while an auto-shut off feature powers down the machine after 30 minutes of inactivity for zero power consumption. The Fortishred 3250SMC will shred a single sheet of A4 paper into approximately 6,000 particles, making it perfect for all high volume and high security requirements. The use of a P-6 shredder such as the Fortishred 3250SMC will aid your GDPR compliance. Shredders that destroy paper to Din Level P-6 are suitable for shredding confidential documentation requiring extraordinary security precautions such as research and development documents, official areas. Automatically shuts off after 30 minutes of inactivity for zero energy consumption. Electronically controlled shield stops shredder when opened for advanced safety.